Joël van de Rhoer was born in Staphorst on the 3rd of December 1875. 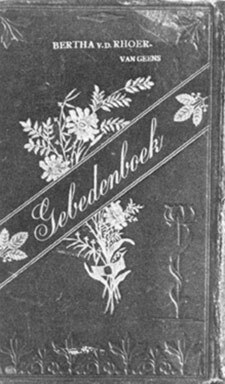 On the 17th of June 1900 he married Bertha van Geens (from Meppel). They had two sons: Jacob Eduard (1904) and Eduard (1908). They were not to follow in their father’s footsteps. Eduard went into the textile business and his elder brother became a lawyer. Joël was one of the biggest cattle traders in the north of the Netherlands. In 1893, at the age of eighteen he earned so much, that he could financially support his parents and their 8 children, almost by himself. But that was not the only thing. In that same year he was able to pay for a Jewish teacher to teach his younger brothers and sisters in Staphorst on a daily base. He also bought a bicycle. In those days a bike cost 300 guilders, because every part was handmade. That same year he paid 350 guilders for a ‘ramplacant’ someone who would take his place in compulsory service. 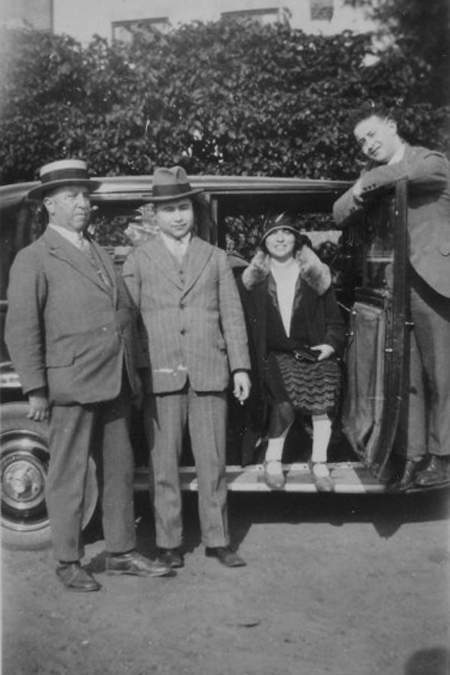 The van de Rhoer family with their new Citroën, which they bought in 1937. It was in the time of Mr. H. Smeenge and the rise of Socialism; the interest in politics was growing. Joël’s authority in politics and cattle trading goes without saying. He did not only know all the farmers but also nearly all the cows. When he came to a stable and saw a new cow, he could name the previous owner. The farmers in Drenthe trusted him so much, they would often give him a free hand when he took their cattle to the market: ‘Take them with you, you know better than we do how much they’re worth.’ they used to say. Joel van de Rhoer was for many years the chairman of the Drenthe section of the Nederlandsche Vereeniging van Veehandelaren (Netherlands Committee for the Cattle Trade) and in that capacity also a member of the board of the Drenthe Agricultural Society. He was also treasurer of the governing body of the Jewish Church. Later he proudly showed an envelope sent from Utrecht, addressed to Joël de Rieke, Meppel. This letter had been delivered without delay. From left to right: the ladies Martha van de Rhoer, Bertha van de Rhoer-van Geens and Rebekka van de Rhoer-van Gelder. 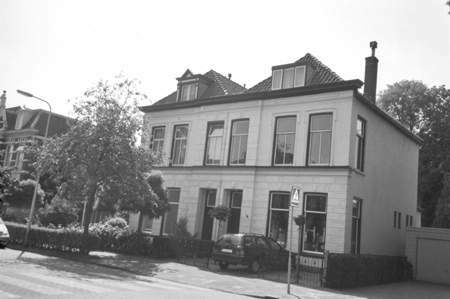 The Van de Rhoer family moved to 6 Stationsweg in 1933. Here their two sons grew up, but here they were also confronted with the growing influence of National Socialism, first in Germany and then in the Netherlands. Joël personally started to feel the pressure, when his company was liquidated already on the 21st of November 1941. When the second Liro-Regulation came into force and all cash and valuables had to be handed over to the Germans, they found ways to avoid this. The family had a fair amount of gold and silver that had to be handed in, but they thought that was going too far. 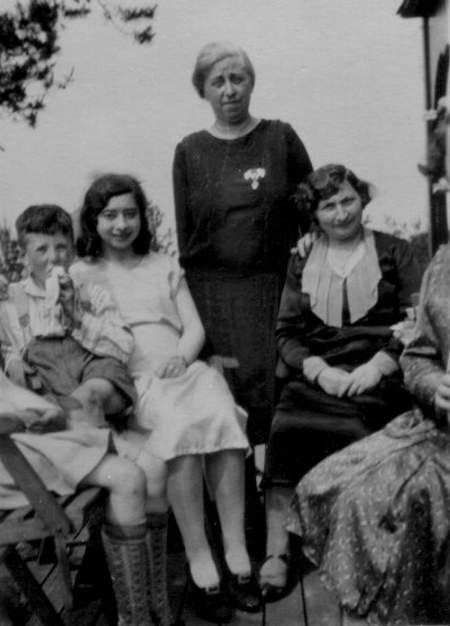 Before the Second World War, son Eduard had spent some time in Westerbork during the mobilisation, where he had made some acquaintances. So it was for that reason they cycled from Meppel to Westerbork with a suitcase full of gold and silver. It was a long way to cycle, but the result of it would be enjoyed later! In Westerbork, next to hotel De Zon, a big hole was dug, in which they buried the suitcase, and a tree was planted on top to mark the place. After the War, (Eduard and Jacob survived the war) the tree was removed and the suitcase full of jewellery was recovered. A striking detail: A few residents knew of this treasure but they did not dream of digging it up. Joël van de Rhoer informed his former employee Van Gijssel that he had been expelled from his house. 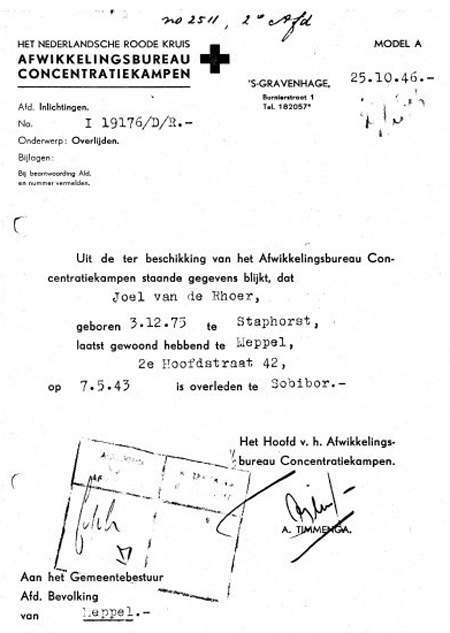 On the 27th of September 1942 van de Rhoer received a letter from Mayor Wisman, stating that the family had to vacate their house on the Stationsweg before the 1st of October and the keys had to be delivered at the Police station before the date mentioned, with exact instructions what should remain in the house and what had to go. The house was confiscated for the armed forces, and for the duration of the War the house was occupied by the Ortskommandatur. Stock-taking was the first step towards robbery of these goods. Soon after the war, the two sons of Joël van de Rhoer were at the Meppel police station to discuss something with the Chief of police. They were asked to wait in the waiting room, but as soon as they sat down they realised that they were sitting in the comfortable chairs of their deceased parents. It was clear that the chairs had been put there by the occupier. The next morning the Chief of police had the chairs delivered to the brothers. 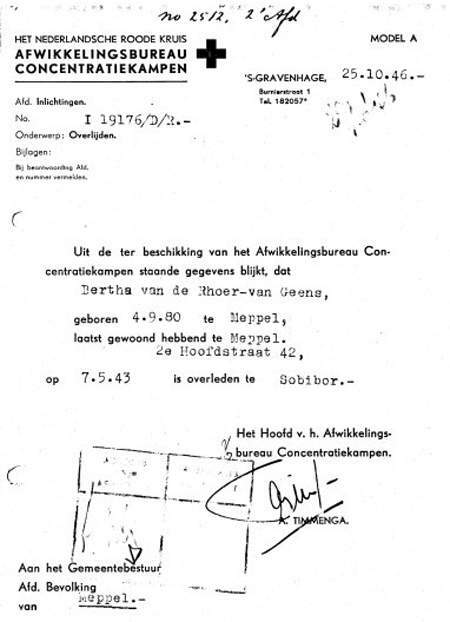 On the 1st of October 1942 Joël, Bertha and Jacob moved in with the Wolf family in the Hoofdstraat. However, on the 2nd and 3rd of October they were collected and transported to Westerbork. There they must have seen some of their family members again. Eduard and Jacob succeeded in escaping from Westerbork. Unfortunately, Eduard could not convince his parents to try and escape. Joël and Bertha remained in the camp until the 4th of May 1943. Their departure was continually postponed, but in the end they were transported to Sobibor, where they died on the 7th of May. Death notice of Joël van de Rhoer, issued by the Red Cross. Death notice of Bertha van de Rhoer-van Geens, issued by the Red Cross. Just before their departure they wrote once more to their children. It was their last contact with them. Finally the time has come that we were so afraid of. They came to warn us that we are on the list, and that we cannot be taken off. So now we have to live with the inevitable. My dearest, you can imagine what this means for us. We still had hope we would see each other soon. But unfortunately, for the time being that is not possible. God willing, everything will sort itself out, but unfortunately, everything has become more difficult. For you, I hope that God will bless and protect you. We will be strong! For you all a big goodbye kiss. It seems that Joël van de Rhoer had hired a safe at one of the banks in Meppel. This safe was broken into by order of the Germans in 1942 and its contents: stocks and bonds, jewellery and other valuable objects had been taken out and have disappeared without any trace. After the war, Bertha’s prayer book turned up again.